In Hansol Jung’s tender, poignant and humorously human Wild Goose Dreams, The Public Theater’s entire third floor space is transformed into a the city of Seoul, South Korea (the inventive and imaginative design is credited to Public and Broadway veteran, Clint Ramos) through a vibrant visual plethora of candy-colored campaigns and neon notifications with a small sampling of blown-up family photos scattered between. This manic mosaic sets the chaotic tone of a modern world where various sights and sound bites compete for attention — though that only creates a feeling of deeper isolation amidst all the noise. 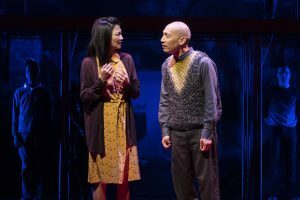 Michelle Krusiec and Francis Jue in Wild Goose Dreams. Photo by Joan Marcus. This fable sets the complex and contrasting motifs of Wild Goose Dreams. As much as the omnipresent atmosphere rules — from the vivid imagery to the personification of the digital prompts, responses and notifications that are given an actual voice (often sung) by a talented and versatile chorus (Dan Domingues, Lulu Fall, Kendyl Ito, Jaygee Macapugay, Joel Perez, Jamar Williams and Katrina Yaukey) who embody the chatter of chat rooms and the constant cacophony of the internet — there are themes and symbols which are universal and inherently human that run as deep as the river that separates North and South Korea — the desire to connect, feeling disconnected, longing and loneliness and relationships, specifically between lovers and amongst fathers and daughters. 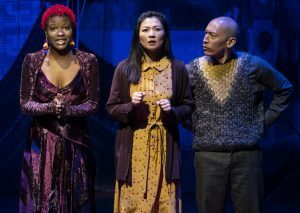 Lulu Fall, Michelle Krusiec and Frances Jue in Wild Goose Dreams. Photo by Joan Marcus. The thrust of the plot is about a South Korean man, Guk Minsung (Peter Kim) who is lonely and feeling “like an ATM” because his wife and daughter are busy making a better life in America while he toils to support them for years as the separation is wearing him down, and a North Korean defector — Yoo Nanhee (Michelle Krusiec) — who swam across the river to freedom but left her family (particularly her beloved father) behind in the process. The two have a chance meet-cute on a dating app called “Love Genie”. Their first interaction (and every other that follows) is adorably awkward and hysterically human. The talented actors, Kim and Krusiec, supported yet bombarded by the blatant, bombastic and distracting presence of the ensemble as the third wheel in any relationship — digital devices — make Minsung and Nanhee charming, complex and entirely lovable, though that is something neither of them can fully embrace themselves. Wild Goose Dreams has so many compelling and interesting twists and turns in its 110 minutes that fly by without intermission that it would be wrong to spoil them — so I won’t — I will only say that it is well worth seeing. The play is refreshingly non-political and lacking in any preaching or pretention. The realities of life in North versus South Korea come up, but they very well could be set on a couple with one half from any major metropolitan and the other from a very rural town. Yes, there are references to the fear and control Nanhee had to deal with in the North (which still haunts her in the form of nightmares), but she also speaks with pride about the simplicity of her life there in contrast to the pressures in Seoul — something that has been well documented in the lives of North Koreans trying to fit in and keep up in such a demanding society. What makes the specificity of place and division such a driving force in Wild Goose Dreams is that North and South Korea are in one of the most unique positions in the world — same race, faces and names even, but still worlds apart. And it is hard to imagine any other area of the world that is, on one half, so open to and, on the other half, so closed off from technology, international interaction and communication. Peter Kim and Michelle Krusiec in Wild Goose Dreams. Photo by Joan Marcus. Another recurring theme is the rich and appropriate metaphors of birds and flight or lack thereof. The angel in the bedtime story makes a swift departure once she gets the first opportunity. Nanhee flees and feels the guilt and burden of that choice. Sometimes the wings are not literal but means such as money. Minsung is called a gireogi appa or “goose father” — a reference to South Korean men who work in Korea to support their wife and children living abroad for the sake of the child’s education in an English-speaking country. The name was chosen because of the migratory nature of geese. There are an estimated 200,000 “goose dads” in South Korea. Then there are other, some slightly more derogatory, bird references to the way that these South Korean fathers are able to support their families: eagle, sparrow and penguin. In Wild Goose Dreams, the penguin is one of the ubiquitous images with multi-faceted meanings. Nanhee recounts seeing her father in a dream as a penguin demanding his wings back — but of course, these are birds that cannot fly. She is frequented, with increasing intensity, by figures of penguins — most often representing her father who she is not certain is alive, tortured or dead due to a botched job from an untrustworthy smuggler who she paid to locate and communicate with her father. The penguin portrayals are some of the most unexpected, provocative and unsettling imagery in the piece. It is also worthy to note that like birds of a feather who are so different in ability — the North Koreans, like penguins, may be of the same species but they cannot fly away (escape) from their situation, however perilous. It is worthy to note, however, that these tuxedo-clad sleek feathered beings are some of the bravest creatures on earth — enduring and surviving despite incredible odds stacked against them. Wild Goose Dreams is one of the most visually spectacular plays that still retains its sense of simplicity and is driven not only by the sights and sounds but the speech and souls of the two main characters who are fighting against the world around them — communications and miscommunications, fears and dreams, expectations and shortcomings and the ever pervasive grip of technology and social connections in the digital realm while they struggle to seek a moment of what feels real and to be seen and heard for who they truly are. 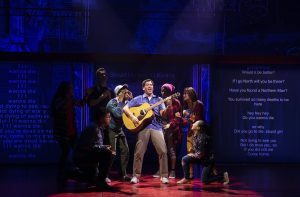 The tenderness, comedy and heartbreak of this masterful piece are owed to the team of exceptional designers and the fantastic cast all through the visionary, clever direction of Leigh Silverman. But the most credit must be given to the female playwright Hansol Jung, who has breathed life into such incredibly and beautifully human characters who exhibit the timeless and universal traits of strength, fragility, love and longing in the most modern (and at times, malevolent) setting. WILD GOOSE DREAMS began performances in The Public’s Martinson Hall on Tuesday, October 30. The play has been extended one week and will run through Sunday, December 16 with an official press opening on Wednesday, November 14. Public Theater Partner, Public Supporter, and Member tickets are available now. Full price tickets, starting at $55, can be accessed by calling (212) 967-7555, visiting www.publictheater.org, or in person at the Taub Box Office at The Public Theater at 425 Lafayette Street.